After spending a peaceful day spotting dolphins and meditating along the jagged cliffs of the Pacific Ocean, we make our way back to the park’s steep entrance road as the sun is about to dip into the azure ocean behind us. Emerging from this coastal desert landscape, Linda and I find ourselves about three-quarters of the way up the hill. What a relief! It’ll be a challenging climb for us. Linda is quite thin due to her illness. We look one another in the eyes, take a deep breath, and begin hiking up to our car at the top of the road. Casually taking our time we inch slowly up. Up. And up. We’re soaking in the oncoming twilight, the sounds of nature next to the coast, and the tranquil meditative state that has overtaken us both. 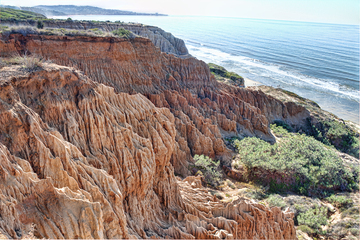 The Torey Pines State Park road rises about three hundred feet in a little over three quarters of a mile. We don’t have too much further to walk. When the sun sets, the park is closed. We can do it. Then.. . . behind us. . . we become aware of an old bicycle clanging. Who in their right mind would be coming into the park . . . up this impossibly steep hill . . . on a clunker bike . . . as the park is closing?! We turn to spot a young man about twenty feet away, easily peddling up the hill on a rusty one-speed bicycle. His brown, wavy, shoulder-length hair softly blows in the breeze. Clearly he’s not out of breath. How can this young man peddle up this crazy-steep hill with seemingly no effort? I’m motionless – mesmerized by this young man, his soft energy, his astounding message. Spellbound, I hear my voice responding with a monotone, “Thank you.” Linda is frozen into silence. As he seems to float up the last stretch of this impossibly steep grade, we simply stand and stare. My mind can’t seem to come to grips with what I’ve just experienced. All at once, a dozen questions come zipping into my head. I’m sputtering, “Did you see what I saw? Did you hear what I heard? How did he know I’m going to write a book called Messages from a Parallel Universe? The book’s name had come to me a few month back, but I had no idea of the content. And who would bicycle up this impossibly steep hill at sunset just as the park is closing? How could this guy so effortlessly peddle up this sheer grade . . . on an old clunker bike . . . smiling pleasantly . . . breathing easily . . . speaking clearly? What am I hearing? I feel my head shaking. No, no, this can’t be happening. Linda and I hold on to each other, unbelieving and at once confirming what we’ve just seen, heard, experienced. As the golden sun melts into the ocean behind us, we glance around to see if anyone else has witnessed this exchange between us and . . .Jesus . . . Sananda. We’re the only ones on the road. With arms wrapped around each other and a sense of wonder and growing apprehension, we recommence our journey up to the crest of the hill. We know there’s only one way in and out of the park . . . this road. Reaching the parking lot we scan back and forth with our eyes. He’s nowhere to be seen. Silently, we wait. Perhaps he’s in the ranger station? The few cars that remain stream out of the parking lot and begin their descent. Within minutes twilight enfolds us. The park closes. We are the only civilians left. The Rangers signal us to leave. He and his bicycle have simply disappeared. In awe and fascination, my mind is swirling, wondering… is this just a dream? When will the book come through me? What will the content be? Did we just experience a miracle? Paularyo — who reside in a Parallel Universe. I’d very much appreciate a note from you letting me know if/how this message inspired you. You can leave me a note below. This entry was posted in angels, channeling, compassion, consciousness, energy, enlightenment, heart, inspiration, intuition, love, medium, metaphysical, oneness, peace, personal growth, psychic, reading, spirit guides, spiritual, spiritual growth, spirituality, transformation, truth, vibration and tagged angels, channeler, channeling, compassion, consciousness, energy, enlightenment, healing, heart, illness, inspiration, intuition, Jesus, journey of the soul, life purpose, love, meditation, medium, metaphysical, oneness, peace, personal growth, psychic, Sananda, soul, spirit guides, spiritual, spiritual growth, spirituality, transformation, truth, vibration. Bookmark the permalink. Completely spell-binding story!! Gave me chills!